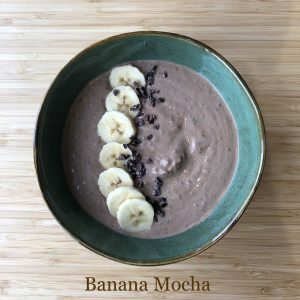 This is a very simple thing to make, but it is something I eat pretty much everyday, so I figured that I would share a few different variations of how I make them; Banana Mocha, Blueberry Peanut Butter (click here for recipe), and Raspberry Earl Grey (click here for recipe). For the base of any yogurt bowl I always use plain yogurt, chia seeds and bee pollen. Chia seeds are really high in fiber, omega-3 fatty acids, antioxidants, there are a load of other benefits too (you can find out more about them through this link). Bee pollen is known to help boost immune system and has many other benefits as well (you can click here to find out more about it), just be careful, if you have any pollen allergies be extremely cautious about using it, or leave it out. I don’t add any additional sweetener to this besides the fruit, because that’s just how I like it, but you can use honey, maple syrup, agave or even brown sugar. *If you don’t have an espresso machine, just dissolve 1 tsp of instant coffee in 3 tbsp of boiling water, again let it cool to room temperature before using. **Bee Pollen is known for improving the immune system and has many other health benefits. If you have any pollen allergies or are pregnant, don’t use it because it can cause severe allergic reactions. To learn more about bee pollen check out this link. In a small bowl combine half of your yogurt, all of the cocoa powder, and espresso; mix with a spatula until the cocoa powder has dissolved into the mixture. Add in the remaining yogurt, chia seeds, and bee pollen; mix until well combined. You can thinly slice the banana and mix it inside or put it on top. Garnish with shaved chocolate or cacao nibs if you like. Chill for at least 4 hours (to allow the chia seeds to soften) or store for up to 3 days covered in the fridge.